This article originally appeared in the Alumni News of The Citadel – Summer/Fall 2013. It is reprinted here in its entirety with the permission of the Citadel Alumni Association. Several photos have been added to this web post which did not appear in the original print version. The original article may be downloaded here. In early 1949 a package arrived at the Kenilworth building, Alden Park Manor, Philadelphia addressed to Mr. Samuel W. Rolph. The package contained the flag which covered the casket of his son, Staff Sgt. Robert C. Rolph, killed in action near Hottorf, Germany, Feb. 25, 1945, during the Rhineland campaign. The flag was a tangible reminder of his and his wife’s decision to have their son’s remains permanently interred in one of the newly established World War II cemeteries in Europe rather than returned for burial in the United States. Mrs. Rolph had recently sent a photograph of her son in uniform to The Citadel in response to General Summerall’s request to display it with other Citadel World War II dead on the memorial gallery wall in the library in Bond Hall. The Netherlands American Cemetery is the only American Military Cemetery in Holland. It contains the final resting place of 8,301 servicemen and women with an additional 1,722 names listed on the Walls of the Missing. There are 40 instances where two brothers are buried side by side. Of the 16 WWI and WWII cemeteries in Europe, the cemetery at Margraten holds the largest number of Citadel alumni. In addition to Robert C. Rolf, ’46, seven other Citadel alumni are buried here and all have been adopted and remembered by grateful Dutch citizens. R. C. Rolph, ’46. 1943 Sphinx. At the end of the summer 1942, Robert C. Rolph entered The Citadel with the Class of 1946. After a year at The Citadel, he, like many other cadets and college students, found himself drafted for the war effort. Rolph was initially assigned to Battery C, 2nd Antiaircraft Training Battalion at Fort Eustis, Virginia. Selected in October 1943 for assignment with the Army Specialized Training Program, he was assigned to Section 6 Company A 2517th Service Unit (AST), Catholic University of America in Washington, D.C. where he studied engineering. However, the urgent need for infantry replacements meant the sacrifice of the AST program and Rolph, like many thousands of others, ended up as a private in the infantry. He was assigned to L Company 3d Battalion, 406th Infantry Regiment, 102d Infantry Division. On Sept. 12, 1944, the 102d Division embarked for Europe arriving at Cherbourg, France, on Sept. 23, 1944, D Day+109. After a short training period near Valognes, France, the 102d Division moved by train, truck, and foot across France and Belgium to the German-Netherlands border. Rolph’s 406th Infantry regiment was temporarily assigned to the 30th Infantry Division and entered combat on Oct. 26, 1944. On Nov. 4, the 406th Infantry regiment, less the 1st battalion, was then assigned to the 2d Armored Division. It was during this time that Rolph received a battlefield promotion from Private to Staff Sergeant. On Nov. 24, the 406th Infantry regiment rejoined the 102d Infantry Division for the Ninth Army attack on the Roer valley. The German offensive in the Ardennes however, compelled the shifting of divisions from the Ninth Army sector to suppress this Battle of the Bulge. The 102d Division was tasked with defending the entire XIII Corps front covering some eight miles along the Roer River. With the front once again stabilized, the 102d Division spearheaded the Ninth Army assault across the Roer River on Feb. 23, 1945, and advanced through the Siegfried line toward the Rhine. Two days after crossing the Roer, Staff Sgt. Rolph was killed in action near Hottorf, Germany, struck down by shrapnel from German artillery targeting the communication lines he and his men were erecting. His last letter home to his father expressing his post war plans he had written six days earlier. Rolph’s body was evacuated back through the 102d Division and XIII Corps casualty collection points eventually joining the seemingly endless procession of two-and-a-half-ton trucks and one-ton trailers filled with dead GIs to the Ninth Army battlefield cemetery at Margraten, Netherlands, one of the first to be used for the interment of American soldiers who fell on German soil, established on Nov. 10, 1944, by the 611th Graves Registration Company. There his remains were positively identified, the condition of the body, obvious wounds and/or the cause of death recorded, government equipment reclaimed, and personal effects inventoried for return to next of kin. Placed in a white cotton mattress cover, Rolph’s remains were buried with his fallen comrades, seven of whom were Citadel men, in a temporary plot, eventually numbering some 17,000, marked with a simple wooden cross or Star of David to await final disposition at war’s end. Even before war’s end, the grateful people of Margraten and the surrounding villages of the Province of Limburg began the simple practice of adopting and placing flowers on the graves of their fallen liberators. In January 1945, local civic leaders formed the Civilian Committee United States Military Cemetery Margraten for the express purpose of exploring ways of paying tribute and to do as much as possible for the fallen allied soldiers. As Memorial Day approached, barely three weeks after the end of the war in Europe, the committee played a key role organizing grateful Dutch citizens who gathered flowers from 60 villages and lay them like a quilt across each of the 17,000 graves. 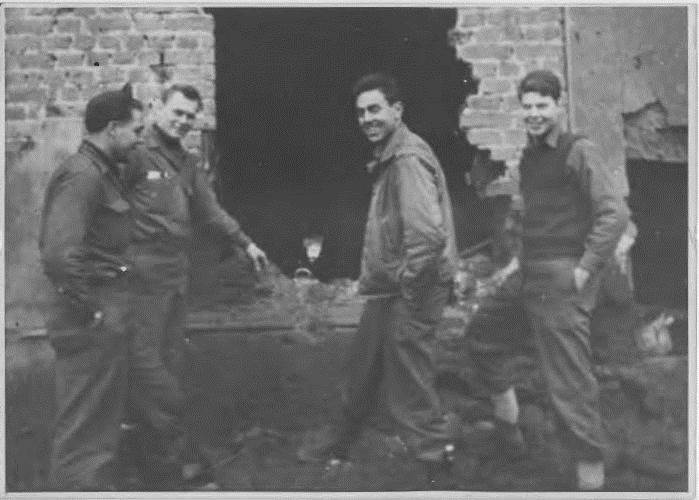 “Thanksgiving with Friends – Germany Nov 1944. Bob (middle) and close friend Bob McCue (right) and two others. 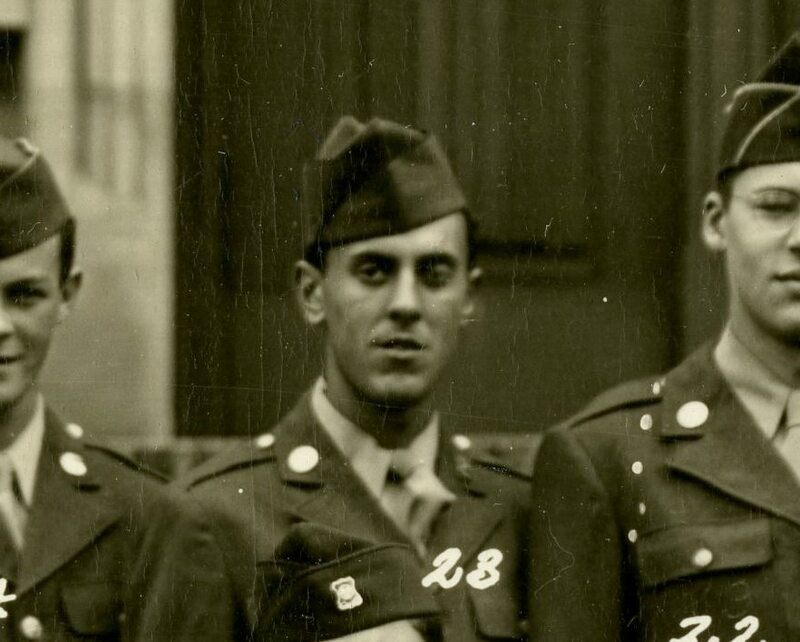 Bob and Bob were soon after killed together from German tank shell shrapnel targeting communication lines being erected by them.” Photo with caption courtesy of the Rolph Family. Perhaps more importantly the Civilian Committee’s real worth was in overseeing the practice of the adoption of individual graves, not only as a sign of respect, but an effort to keep the memory of the fallen alive. 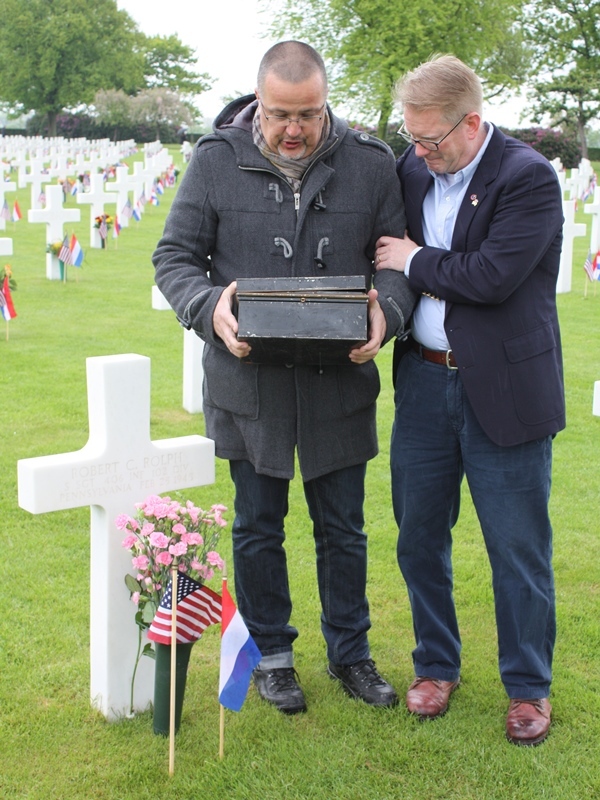 The work of the Committee is continued today by the Stichting Adoptie Graven Amerikaanse Begraafplaats Margraten or the Foundation for Adopting Graves at the American Cemetery in Margraten. The legacy and success of the work of the Foundation may be seen in the fact that all 8,301 graves as well as the 1,722 individual names on the Walls of the Missing have been adopted and there is currently a waiting list of 3,000 persons who wish to participate in the adoption program. In 1946, Congress passed legislation providing for the final disposition of the World War II dead. The responsibility for carrying out this massive program was given to the American Graves Registration Service, Office of the Quartermaster General. A pamphlet bearing the title of the most asked question by next of kin of the Quartermaster General, “Tell Me About My Boy,” explained the options. As in World War I, the next of kin of the fallen were given four options: 1. Remains may be returned to the United States or any Possession or Territory thereof, for interment by next of kin in a private cemetery; 2. Remains may be returned to a foreign country, the homeland of the deceased or the next of kin, for interment by next of kin in a private cemetery; 3. Remains may be interred in a permanent United States Military Cemetery overseas; 4. Remains may be returned to the United States for interment in a National Cemetery. Once the next of kin of the some 270,000 identifiable American dead had made their decision known on Quartermaster Form 345 the work of repatriation and permanent interment could begin. On July 27, 1947, the first sets of remains began the journey from Europe back to the United States. This program continued until 1954. On May 14, 1949, Executive Order #10057 transferred control of the military cemeteries to the American Battle Monuments Commission. The Quartermaster General sent standard letters with the traditional flag informing the next of kin that their loved one had been permanently interred, “You may rest assured that this final interment was conducted with fitting dignity and solemnity….” In 1950, as the final interments at Margraten came to a close, the American Graves Registration Service in a fitting ceremony officially transferred the cemetery at Margraten to the care of the American Battle Monuments Commission. The flag which covered the casket of Staff Sgt. Robert C. Rolph prior to his final interment returned to Margraten 64 years later in the original box in which it had been shipped to his parents in Philadelphia. Earlier this year, the Alumni Association received a package from Robert C. Rolph’s nephew, Mr. William P. Rolph of Ottawa Canada, which contained some of Staff Sgt. Rolph’s personal effects. 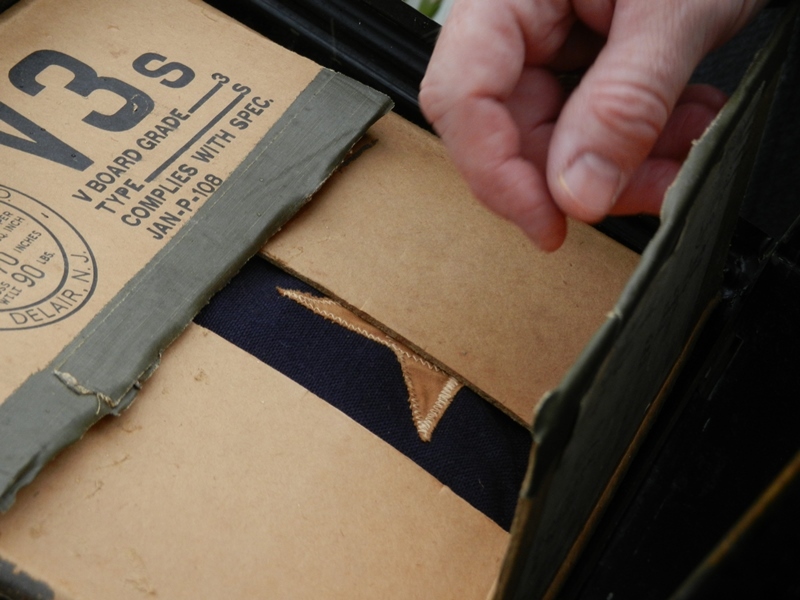 The package eventually made its way to The Citadel Archives which informed Mr. Rolph that The Citadel would gladly accept those items directly related to Robert Rolph’s time as a cadet, but due to space limitations could not accept the other items which included the interment flag, gold star banner and assorted photos and patches. Mr. Rolph indicated that he would like to have the items returned for donation to the Pennsylvania Historical Society. Having been made aware Mr. Rolph’s intentions, I contacted him offering an alternative home for his uncle’s flag and other items. Having a relative interred at Margraten and having done research on the American Battle Monuments Cemeteries and Commonwealth War Graves Commission Cemeteries overseas in 2007, I was well aware of the significance of the adoption program at Margraten and knew where to find Staff Sgt. Rolph’s adopters, Rob Brüll and his 14 year old son Micha. In May 2012, they had left a message on a memorial website created by Roger Long, ’89, hoping to contact any of Rolph’s family members wanting them to know that Robert C. Rolph was not forgotten. Mr. Rolph’s response was emotionally and emphatically in the affirmative that his uncle’s flag and other items be sent to the Brüll family. He and his brother knew their uncle was buried in The Netherlands but did not know where nor under what circumstances. In addition to the flag, William Rolph donated his uncle’s Purple Heart certificate and the Gold Star banner displayed by his parents. Roger Long, ’89, (right) presented to Rob Brüll the flag which covered the casket of Staff Sgt. Robert C. Rolph prior to his final interment in 1949. 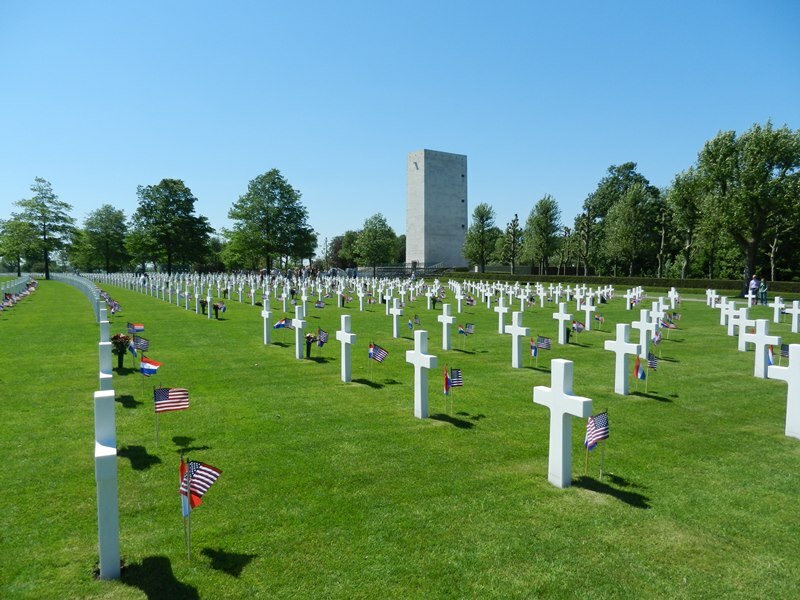 The Memorial Day ceremony at Netherlands American Cemetery was held on the afternoon of May 26. Although rainy and unusually cold, the weather did not keep adopters from placing flowers on more than 80 percent of the graves nor deter the approximately 1,000 people in attendance from honoring the fallen. Beforehand, Long, Rob Brüll, Gregor Franssen [also an adopter of a Citadel Man] and several friends of The Citadel Memorial Europe met in a local café. The group took time to look through a set of wartime Sphinx yearbooks and to present the personal effects of Robert C. Rolph to the Brülls. An hour before the start of the official ceremony, the group gathered round the white marble cross that marks Rolph’s grave at Plot D, Row 9, Grave 8. The grave of his classmate, Frederick D. Melton, ’46, is just a few yards away. There, as the grey sky of the Low Countries began to pour down rain, Roger Long presented to Rob Brüll the flag which covered the casket of Staff Sgt. Robert C. Rolph prior to his final interment in 1949. The flag, still in the box in which it was shipped, had made a round trip journey back to the cemetery at Margraten from which it originated almost 65 years earlier. It is only the second known interment flag to be presented to the adopters of one of Margraten’s Boys. Steven V. Smith. Born in El Paso, Texas, Major Smith graduated from The Citadel in 1984 with a BA in Political Science and received a commission as a Field Artillery Officer. He served twenty years in various command and staff positions from battery to Corps level in the active and reserve components. Major Smith joined The Citadel’s Commandant’s Department in August 1998 and is currently serving as the Tactical Officer for the Regimental Band and Pipes. Major Smith has a Masters in American History, is a member of the Society for Military History, the South Carolina Historical Society, and was recently inducted into Phi Alpha Theta, National History Honor Society. Regarded by many on campus as The Citadel’s “unofficial” historian he has written many articles for the school paper, and made presentations to alumni groups on little known or forgotten Citadel history, traditions, and customs. He is currently conducting research for the Centennial History of the Citadel Regimental Band 1909-2009. Major Smith is a founding member of the board of The Citadel Memorial Europe Foundation.